The X-Arcade™ was designed to be used with a variety of games and emulators and will work with virtually any game or emulator on your PC in the default Mode 1 without programming. Always try first to change the control settings in the emu/game rather than programming so you don't have to remember which mode is set to which emu/game. 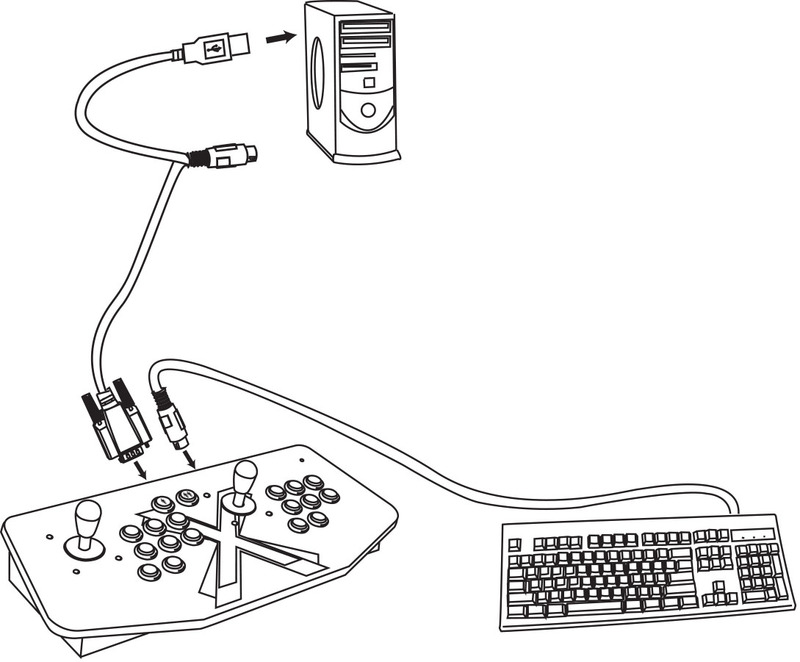 However, for the few PC games that do not allow you to reassign the keyboard keys within the game itself, you can instead use one of the programmable modes built into the hardware programming chip. Mode 1 is set for emulation software (MAME™) and is non-programmable. This setting is preset so that all of the buttons are already programmed and configured to work perfectly with every MAME™ game. Before you attempt to reprogram your X-Arcade, test that it is working in Mode 1 first. At first, programming the X-Arcade™ is best performed in the X-Arcade™ Test Program or any text editor (like Notepad) so that you can see the results of the programming. As you become more accustomed to programming The X-Arcade™, it will be possible to program the X-Arcade™ 'on the fly' within a game. Programming is for the PC only and does not function on game consoles. When the light or red-lit button is on you are in play mode, when the light is off you are in program mode. MODE 1 (switch closest to the serial cable, or yellow wire on the switch itself) cannot be programmed. The mouse buttons on the Tankstick/trackball cannot be programmed, these are the 2 rear pinball buttons and red-lit exit button on newer models. For most games and emulators (including MAME™) you will want to use Mode1, and change any settings in the game or emulator accordingly. This saves; the programmable memory for games or emulators that do not have; an option to change the controls, and it is easier to remember. On newer Tri-Mode PCBs and Tri-Mode X-Arcade controllers only, mode 2 is programmable to any keyboard key. Tri-Mode X-Arcade controllers have the mode switch labeled 1-4 as shown here. You can also check if you have a Tri-Mode PCB by switching to mode 3 or 4 which will make the X-Arcade act as a gamepad instead of a keyboard. Download the X-Arcade Programming Software (PC only) and run it. Slide the switch on the back of the X-Arcade to Mode 2. Press the PM button on the back of the X-Arcade, the power light should go off and the software should now recognize that it was plugged in and is ready to program. Simultaneously press any button or direction and a single keyboard key you want to program until you see the light on the X-Arcade blink. Once it blinks it has been programmed, and you can release both held buttons/keys. Continue programming it per step 5, and once you are all done programming just press the Programming button on the back of the X-Arcade to exit programming mode (the light comes back on). On older model (non-Tri-mode) X-Arcade controllers and PCBs, modes 2-4 are fully programmable to any keyboard key. Oldest models only: To change modes, you must slide the switch on the back to desired Mode position, and then press the SAVE/LOAD button TWICE to load that mode (the LED on the X-Arcade™ should go out on the first push, and back on with the second). When the X-Arcade loses power, you will need to press SAVE/LOAD button TWICE to recall the programming. Start by choosing the mode you wish to program by moving the switch away from the serial cable to MODE 2, 3, or 4. Again, MODE 1 cannot be programmed. Press the Programming button on the back of the X-Arcade™ (the light turns off). Press AND HOLD any button or direction on the X-Arcade™ that you wish to change. While still holding a button or direction from step 3, press and hold a key on your keyboard until the LED on the X-Arcade™ blinks. Once it blinks it has been programmed, and you can release both held buttons/keys. Repeat steps 3 and 4 to program additional buttons/directions. You can print a blank layout to write down your settings. Enjoy classic gaming! The X-Arcade™ can be reprogrammed as many times as you like. All the programmed buttons will be saved permanently in the X-Arcade's™ onboard memory. Even if you turn off the computer or unplug the X-Arcade™ the programmed buttons will not be lost. You can alternatively use AutoHotKey to reprogram by software.